CableFree Emerald is a complete range of 4G LTE-Advanced products featuring advanced cellular technology. Ideal for Public as well as Private LTE networks, featuring latest 3GPP Release 14 standard support, CableFree 4G LTE is ideal for Mobility as well as Fixed Rural Broadband applications, as well as Safe City, Mobility, Automation and Security applications. An upgrade path to 5G and beyond is already defined, with support for IoT (Internet of Things) already included. All of the the CableFree range of LTE products feature latest generation technology and upgradable features for future-proof networking and performance. CableFree Emerald 4G/LTE Software Defined Base Stations with advanced features and “stand alone” capability for private networks. Our LTE BS technology offers LTE-A technology and transmit powers up to 2x 20W for high capacity, long range networking, and uses Software Defined Radio technology with easy upgrade to new features and high capacities. 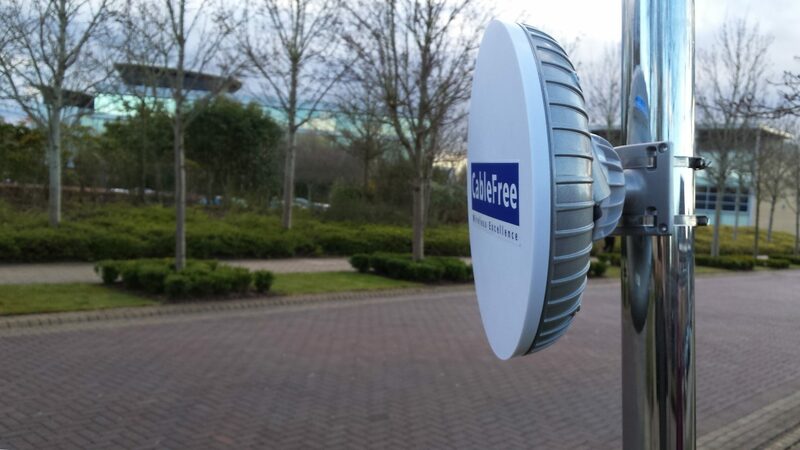 CableFree offers 5GHz Band 46 LTE Base Station and CPE devices for operation in Unlicensed 5GHz spectrum, enabling smaller operators and private customers to build LTE without requiring access to licensed spectrum. CableFree offers a wide range of 4G/LTE CPE devices for indoor and outdoor applications, fixed, mobile and nomadic users, buildings and vehicles. Indoor CPE devices are ideal for residential and business applications with integrated WiFi Access point, Router, optional VOIP/POTS ports. Typically mounted in an indoor location, ideally in a window or location with favourable LTE signal coverage for best performance. The indoor routers are available with WiFi and VOIP RJ11 Analogue Telephone ports to connect traditional telephone and fax devices over the LTE network. Optionally, these CPEs can be customised with operator logos, different case colours and form factors to meet operator needs. Ruggedised 4G LTE CPEs are optimised for Industrial Applications with ruggedised feature, DIN-rail mounting options, waterproof connectors and SIM slot. These industrial grade CPEs are ideal for Automation, Machine Vision, Robotics, Mobility, Remote Vision, Self Driving Vehicles, and other industrial applications where mobility and high speed connectivity is required. Mobile WiFi Hotspots with 4G LTE backhaul (MiFi) including remote Cloud Management are feature-rich and can be deployed outdoors or indoors. Customisable versions for in-vehicle use for Mass Transit, Police, Law Enforcement applications. The MiFi devices feature internal battery power for mobile and nomadic applications, and also for regions where power supplies may be intermittent or unstable. Power / Charging via USB is standard. CableFree offer custom SIM cards to create private LTE networks. These SIM cards can be customer-branded with logos and contact information specific to each operator and customer network. SIM cards can be provided on a per-project basis in any quantity required. Are you considering building a 4G LTE Network? You’ll need access to spectrum. Generally, 4G technology uses licensed frequencies and requires regional, national or customer-specific operator frequency licenses to operate. CableFree Mobile WiFi hotspot products can use existing 4G operator networks and can use SIM cards and billing plans from those operators in order to provide bandwidth. For customers without access to LTE frequency bands or networks, we can suggest our other complimentary range of products which can operate in other licensed or unlicensed frequencies. The CableFree range of LTE products are normally implemented by approved integrator partners on a project-specific basis to create a complete network solution.